Happy Fall! 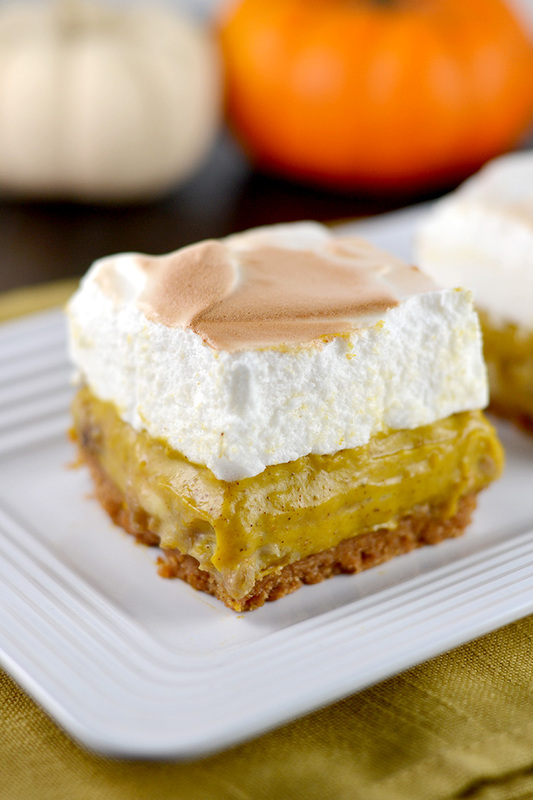 I should explain why I haven’t posted in almost 6 months but instead of boring you with excuses of being busy, starting a new job, and visiting China, lets just move on to the good stuff: these tasty Pumpkin Banana Cream Pie Bars with Marshmallow Topping. Sound like a mouthful? It sure is. Fall is always a comforting and exciting time of year. Pumpkins, squash, and apples fill the markets, the leaves start to change, and there’s a crispness in the air that allows big cities (like NYC ) to breath again. Pumpkin and sweet potato recipes remain popular fall dessert staples both in restaurants and online so I couldn’t resist participating in this annual baking tradition again. This recipe combines a classic old-fashioned pie with autumn flavors and fluffy marshmallow instead of whipped cream. Why marshmallow? Simply because I have a small obsession with the billowy overly sweet melt in your mouth confection. You can replace this with standard whipped cream, if you prefer. I used a classic banana cream pie recipe from “Baking,” by Dorie Greenspan as the base for this pumpkin version. As I probably mentioned in previous posts, Dorie Greenspan is quite the expert on baking and also a fan of my grandmother’s work (as mentioned here). I adjusted the recipe to accommodate pumpkin puree and the warm and comforting pumpkin pie spices. I also caramelized the bananas for extra flavor and depth (though fresh may be used). And for a little crunch, I used a graham cracker crust instead of traditional butter based pie dough. 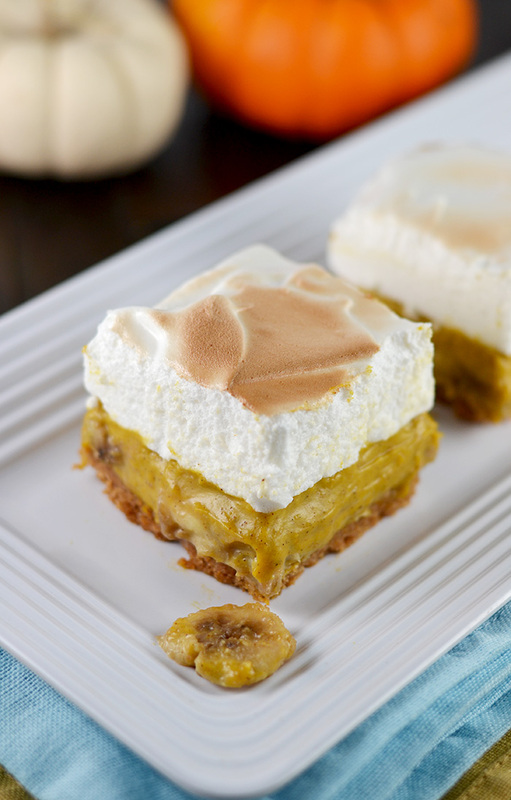 Part pumpkin spice pudding and part banana cream pie, these Pumpkin Banana Cream Pie Bars are an addictive sweet treat that are perfect for the season. Bring the milk to the boil. Meanwhile, in a large heavy-bottomed saucepan, whisk the yolks together with the brown sugar, pumpkin puree, cornstarch, cinnamon, ginger, nutmeg, cloves and salt until well blended and thick. Whisking without stopping, drizzle in about 1/4 cup of the hot milk — this will temper, or warm, the yolks so they won’t curdle — then, still whisking, add the remainder of the milk in a steady stream. Put the pan over medium heat and, whisking constantly (make sure to get into the edges of the pan), bring the mixture to a boil. Boil, still whisking, for 1 to 2 minutes before removing from the heat. Whisk in the vanilla extract. Let stand for 5 minutes, then whisk in the bits of butter, stirring until they are fully incorporated and the custard is smooth and silky. You can either press a piece of plastic wrap against the surface of the custard to create an airtight seal and refrigerate the custard until cold or, if you want to cool the custard quickly, put the bowl into a larger bowl filled with ice cubes and cold water and stir occasionally until it is thoroughly chilled, about 20 minutes. Slice the bananas in ¼ slices. Melt 2 tablespoons butter in a small-medium skillet. Add 2 tablespoons brown sugar. Cook until syrupy, about 4-5 minutes. Cool and chill. Grind or crush 10 graham crackers. Mix crushed graham crackers with 5 tablespoons melted butter and 2 tablespoons sugar. Grease an 8x8 inch cake pan. Line with a sheet of parchment paper, allowing edges to hangover the sides of the pan (this will allow you to easily lift the pie out of the pan so they can easily be cut into bars on a cutting board). Spread the graham cracker mixture in the cake pan. Using the bottom of a measuring cup, lightly press down to ensure the crust is even. Sprinkle gelatin over the 1/4 cup cold water in a small bowl. In a small saucepan fitted with a candy thermometer, heat 1/3 cup water with the corn syrup and sugar. When the sugar syrup has reached around 210ºF degrees, begin whipping the egg whites until frothy. When syrup reaches 245ºF, remove from heat and increase the mixer speed to high. Slowly dribble the syrup into the whites as they are whipping. Scrape the softened gelatin into the warm pan that was being used to make the syrup, and stir until dissolved. Slowly drizzle the gelatin into the whites as they are whipping, avoid pouring it on the whip. Add the vanilla and continue to beat for 5-10 minutes or until room temperature. Whisk the cold custard vigorously to loosen it, and spread about half of it over the bottom of the pie crust. Top with the caramelized banana slices. Spread the remaining pastry cream in an even layer over the bananas. Using a spatula, place large dollops of the marshmallow topping all over the top of the custard. Lightly spread to create an even layer. Toast marshmallow using a kitchen blow torch or by placing it under the broiling for 2 minutes. Chill for 1 hour. To remove from pan, simply lift parchment paper ends and place on a cutting board, cut into bars. Polish Mazurka (cookie bars)-Pumpkin Spice Caramel Optional!